The Madrigals earned top marks with a gold rating in Boston, sending them to competition at Carnegie Hall. They will continue efforts to fund the rare opportunity to perform at Carnegie Hall. GALLIPOLIS — Gallia Academy Madrigals are raising funds to support a trip to Manhattan to perform in Carnegie Hall at the Festival of Gold & the National Youth Choir Festival. In April the Madrigals traveled to Boston, Ma. to perform at the World Strides Heritage Festival, which gives music students in high school a chance to perform on a higher stage and promote musical excellence. 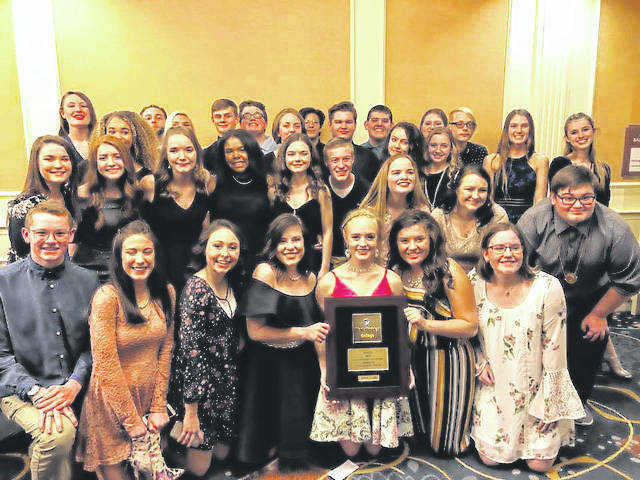 The Madrigals earned a gold rating in Boston, earning the opportunity to travel to Manhattan in March of 2019. In order to fund the trip to New York, the Madrigals and Gallia Academy Choir Boosters have already begun fundraising and have opened a Go Fund Me account. So far the Madrigals have participated in First Friday, partnering with Osmosis Marketing to hold a fundraising event while doing a sing and dance along. Madrigals had a stereo and would sing and dance with the public to help promote their fundraiser. The fundraising efforts are continuing with a gently used shoe drive. While the drive will start in full in August, they are already collecting shoes to help raise funds. They will continue to do fundraisers throughout the year, but have developed tiers for donors. Four tiers ranging from $100 to $1,500 are available, with benefits ranging from Madrigal performances at the highest level to having your name associated with all publicity and a framed picture at the lowest level. As efforts continue to fund the trip, updates and opportunities will continue to be made known through the “Madrigals Take Manhattan” Facebook page.